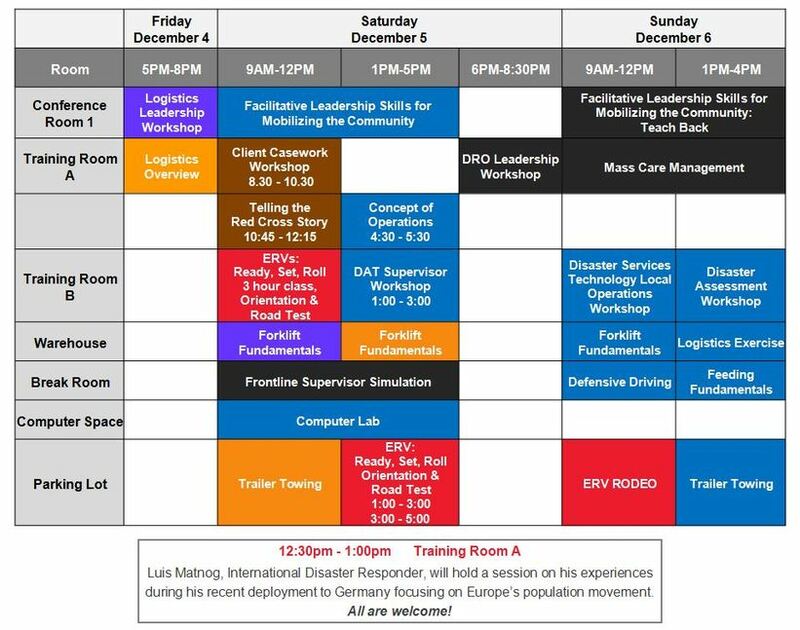 The 2015 Massachusetts Disaster Institute was the largest training ever held in the northeast and it was a huge success! Both seasoned volunteers and new volunteers came together for a weekend crash course in American Red Cross culture, team building, and responding skills. Over 140 people came to learn from across the country, representing 11 states. We can't wait for next year! All of our donors for helping make this event affordable and efficient. The instructors who dedicated their weekend to train others in their region and across the country. All of the attendees who came out to improve their disaster response skills in order to help the American Red Cross respond. Designed for those who wish to add the position of Communications Ambassador 1 to their volunteer roles. Ambassadors will be expected to represent the Red Cross at local outreach events, recruitment fairs, parades etc. The expected time commitment for this role is one shift per month. 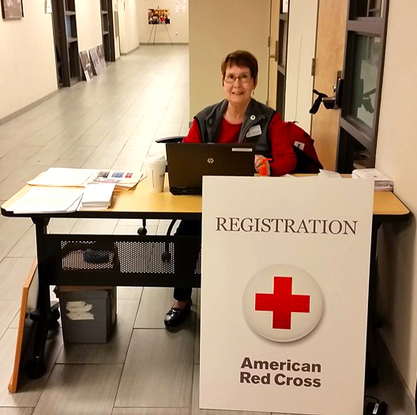 This training will cover the volunteer recruitment and on-boarding process, talking points for all lines of service, publicly representing the Red Cross, departmental contact referrals, building toolkits, and updated Ambassador expectations and opportunities. 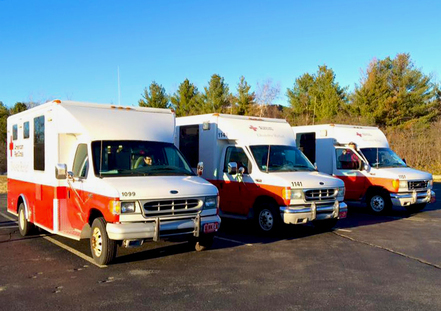 Help us expand the reach of the Red Cross presence in communities across the Commonwealth and build your existing teams! Prerequisite: Recovery Services: An Overview, Casework and Recovery Planning Fundamentals, Direct Client Assistance Fundamentals, Direct Client Assistance CAS 2.0. In this workshop we will provide opportunities for caseworkers to practice their interviewing techniques, document casework, make appropriate referrals, and build a client recovery plan. This workshop is intended for anyone with client contact, specifically those involved in client recovery. Prerequisites: Concept of Operations: An Overview. In this workshop we will explore the Disaster Cycle Services Concept of Operations. The entire workshop will offer an insight into how meetings/reporting/products are developed and distributed on a disaster. This workshop is intended for any Disaster Responder interested in learning more about Red Cross’ operational structure. Use this time to do online training in the computer lab. There will be someone available to help you set up to take EMBARC courses, FEMA ICS courses, Basic Food Safety, or answer questions about Volunteer Connection. This workshop introduces the roles, responsibilities, and tasks of a DAT Response Supervisor. The audience is for current DAT Supervisors or DAT Members interested in learning more about expectations of a DAT Supervisor on the scene. This course is designed to teach driving safety and is taught to all Red Cross staff and volunteers who drive Red Cross vehicles. It is required for anyone that will or may in the future drive a Red Cross vehicle. The purpose of this workshop is to further train workers to conduct Detailed Damage Assessments accurately, efficiently and safely when assigned to a disaster response. Prerequisites: Must hold an SV GAP. This workshop is intended as a refresher course for those who hold a SV GAP. This is a post-Frontline workshop to share best practices and a refresher on the responsibilities of a Supervisor on a DRO. There will be breakout sessions for Client Services, Logistics, Mass Care, and External Relations. Prerequisites: Disaster Cycle Services: An Overview, valid drivers license, an unattested driving record verified by the RMV. ERVs: Ready, Set, Roll is basic level course that provides participants with the opportunity to learn about and use an emergency response vehicle (ERV) and all related equipment. In the first session, participants learn about the safe use and operation of an ERV. At the conclusion of the first session, participants complete a true or false question course review. In the second session, participants receive an ERV orientation and take a road test. Prerequisites: ERV: Ready Set Roll, ERV orientation and road test. Calling all new and old ERV Drivers! Meet, compete, and test your skills. Team up with ERV Drivers from throughout the Division on a specially designed ERV obstacle course. This is an instructor-led professional development course. It discusses what is meant by the term facilitative leadership in the Red Cross context, as well as the challenges associated with being a facilitative leader. Role plays that center around working with stakeholders and partners give participants a chance to apply models for interest-based problem solving and intervention. This course is for Red Cross staff and volunteers who are responsible for building relationships, leading and participating in community planning, coordination and mobilize activities. The purpose of this course is to prepare participants to perform the tasks of Red Cross Feeding workers in support of a local incident such as a single or multi-family fire, and a disaster relief operation. ​Prerequisite: Logistics: An Overview, Forklift Module 1. This is a live trainer led course that uses the Module 1 (prerequisite) content to deliver hands-on training, including a forklift inspection and operator driving test. This courses meet the requirements to work in Red Cross facilities that are managed by national headquarters or regions on a day to day basis, or one that is opened to support a disaster relief operation on a temporary basis. ** Because the Red Cross pays a fee for each participant who takes Module 1 (prerequisite), it is important that only those workers who qualify for and are in Logistics warehousing or Mass Care bulk distribution enroll in this course. If you are interested in completing the training you should talk with Brian Sheehy (brian.sheehy@redcross.org), Logistics Program Support Manager, and make sure that this course is the right fit. You should have disaster experience in order to participate in this course. Prerequisites: Applicants should have the training and experience in the activity in which he or she decides to become a supervisor. The purpose of this course is to prepare responders to lead a team of disaster workers to deliver high quality client service and to create a climate that promotes worker satisfaction. This will identify what it takes to organize and lead a work unit and outline the supervisor’s role in building a team. Prerequisites: Disaster Cycle Services: An Overview. Instructor-led, basic level course designed to give participants an overview of the Logistics group and the activities associated with it. Participants will learn about the skills, abilities, and knowledge needed by Logistics workers and how they can become involved in their local chapter. Prerequisites: Must be a current active member of the Massachusetts Logistics team. Participants will practice skills needed by Logistics workers and learn how they can become involved in their local chapter. Prerequisites: Disaster Cycle Services Overview, Mass Care Overview, Shelter Fundamentals, Shelter Management, Bulk Distribution Fundamentals, Feeding Fundamentals, Disaster Frontline Supervision/Simulation, Operations Planning, Disaster Operations Control. Mass Care Management is an instructor-led, advanced level course that introduces the roles, responsibilities and tasks of the a Mass Care Manager. This course is meant to prepare Mass Care managers to successfully perform required Mass Care management tasks on a regional disaster operation, scale to a district / national operation and give them an opportunity to become familiar with Mass Care and other operational job tools. Disaster Public Affairs is a course that explores how public affairs workers tell the Red Cross disaster relief story, principles for initiating and maintaining a public affairs response, and key disaster messages. The course is designed for individuals who will serve as service associates, supervisors or managers in the Public Affairs activity on national relief operations. This is a basic level course designed for DAT members to review some basic principles of photography, videography, and using social media on scene at a disaster. We will review what types of information is useful to gain during a response that can then be used for marketing, financial development, pitching media and recruiting new volunteers. Prerequisites: Must hold a Regional Driver position. Learn how to tow a Shelter Trailer! Intended for current Regional Drivers willing to help with trailering resources needed on the scene. To take any of the required Prerequisites available online, please refer to EMBARC. Need assistance logging into EMBARC? Click here or call the IT Service Desk at 1.888.778.7762 (press 1 or 2, and then press 7). If you have questions about the prerequisites please reach out to the contact provided under your region tab.